1.5 grams. Good for 66 gallons. 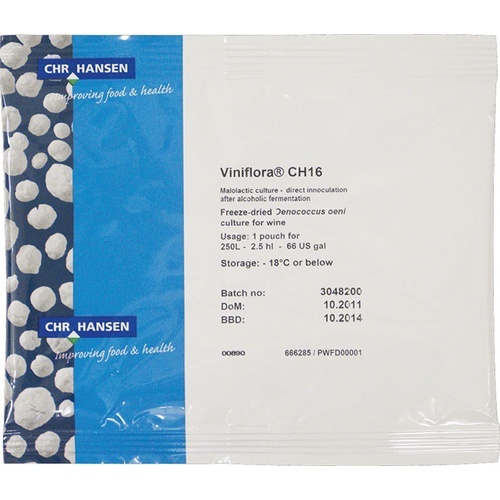 Viniflora CH16 is a freeze-dried pure culture of Oenococcus oeni. This malolactic bacterium has been carefully selected to induce malolactic fermentation in red wine with high alcohol levels, after direct inoculation. Viniflora CH16 has been isolated from a 16% Petit shiraz wine in the Russian River area of California, USA. The bacterium's natural environment gives a good picture of its application; CH16 has been carefully selected for its outstanding ability to conduct fast malolactic fermentation in high alcohol red wine (up to 16% v/v) with a pH value above 3.4. Outstanding tolerance to high alcohol levels. Viniflora CH16 should be added to dry wine, immediately after the alcoholic fermentation. Viniflora CH16 should always be inoculated directly into the wine. No rehydration or reactivation is required. For more information about ML Bacteria, please see MoreWine! 's Guide to Malolactic Fermentation. I have already used CH16 last season and the result is good .So l am confident that it will give me satisfaction for the coming crushing season in which I am going to crush about 50 tons of Aglianico grapes. Cab Sauv MLF is stuck! I have used the CH35 for white wine with success so I am trying the CH16 for red (Pinot Noir). I am making my first batch of red wine and several sources I've read advised to use this to soften acid flavors. solid works, does what it was made to do big reds! I have used CH16 in my wine in the past. It starts conversion quickly, and finishes completely. Max batch size is 66 gallons. I am only making 6. Any concerns with inoculating the smaller batch with the entire packet? Asking due to the short shelf life of the bacteria once opened. BEST ANSWER: Hi Kevin - Adding the full packet should not cause any problems, it will cause the MLF to move along faster which is not a bad thing. You could store any leftovers in the freezer but it's not guaranteed to hold for a long period of time. Package arrived in sealed plastic bag. I kept in fridge for about 4 days. I pitched ML with the ML nutritions per instruction and has been a strong and consistent ML action. So far happy with result; will check chromatography soon. This product is easy to use as it is packaged as an appropriate dose for 1 barrel (60 gallons) of wine. I have used it for three vintages now and had great results. No MLF start or completion issues. I use ActiML and rehydrate the ML bacteria before inoculation per the MoreWine recommendations. I would definitely recommend this product. This Malolactic bacteria works very well. It is very easy to use and exceeded my expectations. I know I can always count on this strain for a good ML fermentation. It is my go-to strain. Super easy to use, results in a trouble-free malolactic fermentation every time. Ordered and quickly received the culture for my wine fermentation. So far, it has been easy to use from initial prep to inoculation. It has worked as advertised and really help improve our wine making process. I have used this Malolactic culture for at least 10 years, success every time. Fast to start and finished with 10 days usually.